Attracting personal injury clients (people who have suffered a physical or psychological injury through the action or inaction of another person or group) is something which lawyers can find problematic over the years, as there can be problems with gaining people’s trust for long enough to persuade them that legal advice is easy to gain access to. This means that personal injury internet marketing is a set of tasks with many pitfalls that need to be considered. Personal injury inquiries cover a number of bases – there are motor vehicle accident claims, claims against an employer for something which happened on their watch, medical malpractice cases, liability, assaults, pet assaults, and more. Personal injury law advertising needs to be able to reach potential clients as soon as possible. Because of this, there are some methods of advertising which are more useful for solving the issue of how to get personal injury cases than others. The ones which give quick results with very little lead time are better than other forms of personal injury attorney advertising. AdWords is perhaps the best method of getting personal injury leads, as that way attorneys can take advantage of people who are looking for legal services right at the moment when the injury is fresh and there is a strong need of quick help. AdWords allows personal injury lawyers to put their advertising right in front of people who are making specific searches. While this is a very effective method in marketing personal injury practice, people undertaking it should remember that AdWords campaigns and PPC can be quite expensive – personal injury claim adverts can cost up to fifty dollars per click. Nevertheless, you should use Google ads for sure when there is a strong need of internet marketing for law firms. Our company has a lot of experience when it comes to working with clients who handle personal injury claims. Thus, we can share a strategy we used to promote personal injury law firms via AdWords and provide some tips to get better results of running such a campaign to get personal injury leads. In one of our latest AdWords campaigns for a personal injury law firm, we helped our client to increase sales by 50% within 1 month. Managing an AdWords campaign, we experienced a lot of success by simply keeping to an established strategy. Many people have complained to us in the past that AdWords was too expensive for them, but our response is simply that it hasn’t been configured correctly. Using a fairly basic AdWords campaign with properly grouped positive and negative keywords (including an active remarketing group), a well-thought out approach to using SEO (website marketing for attorneys) to properly optimize the content which was included in the law firm’s online presence as a whole, and proper research into what competitors were doing with their own advertising campaign and initial content, allowed us, over the course of two weeks, to run a campaign which resulted in 15 calls being made from prospects to the law firm. These fifteen separate phone calls resulted in 5 prospects becoming clients, all at a cost of $600. Our first step was to understand what the target audience of a personal injury lawyer is and how a potential client will be looking for an attorney. This helps us to build more effective AdWords campaign and thus get more personal injury clients. Moreover, keywords research is a basic and vital step before setting up a campaign. 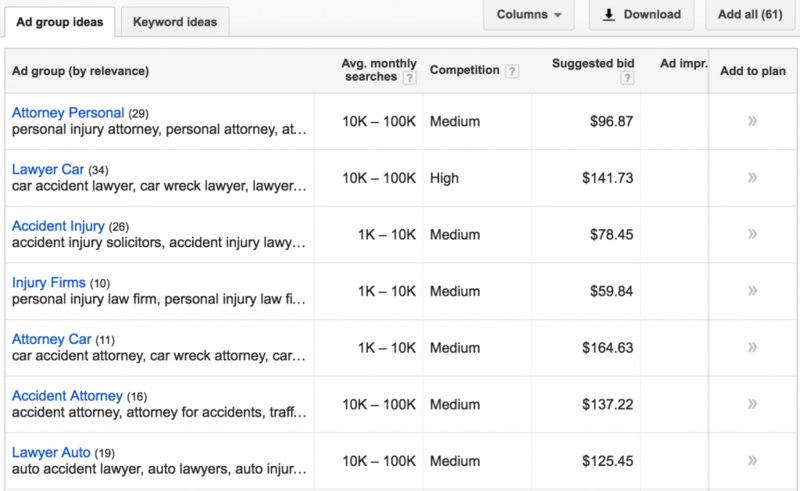 Keywords research (both positive and negative) and grouping were the very beginning of the process of how to advertise a law firm, as keywords are the way in which AdWords and PPC fundamentally work. Positive keywords are the keywords which will be used for client searches, while negative keywords are used to avoid the adverts appearing on searches where they would do no good. The main sequence of the AdWords campaign pre-creation process was as follows: keyword research, competitors research, and, finally, getting paid traffic from competitors research. How Do We Manage an AdWords Campaign to Get Personal Injury Leads? There are, as mentioned above, two types of keywords which are commonly used in AdWords campaigns – positive and negative ones. Positive keywords are the first set of keywords which should be looked at, as they will be the main tool in personal injury lead generation. Positive keywords are the keywords which, when used by a client, will cause adverts to appear on their searches. Positive keywords are normally put into groups with others like them – AdWords campaigns are separate into a number of different adverts, and each of them has its own group of keywords which are thematically grouped. Negative keywords are used in the opposite way to positive ones – where positive keywords are used to show when an advert should appear on a search, negative ones ensure that adverts do not appear when they are not necessary or wanted. Negative keywords include keywords which are much too broad to really get proper responses, to help the campaign and the people running it avoid unnecessary expenditure from people clicking the advert when they are ultimately not looking for the services provided. 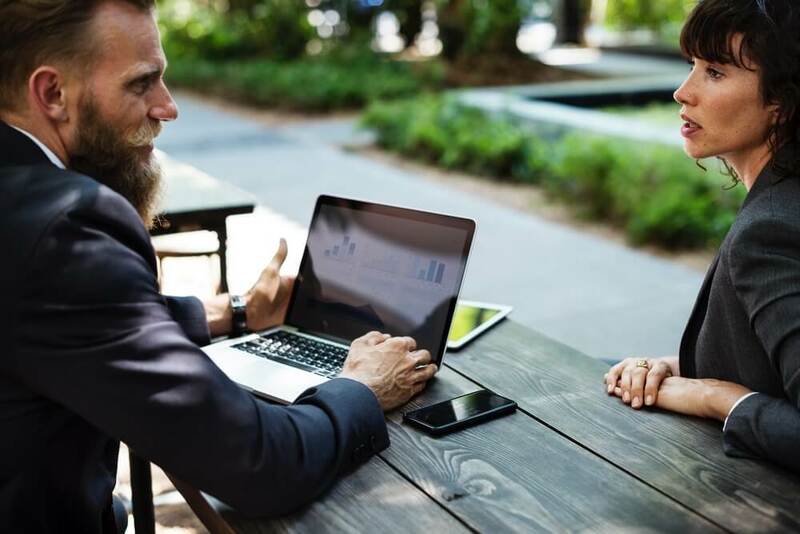 When it comes to personal injury marketing for lawyers, it is vitally important to make a connection between lawyers and their potential clients as those people may already feel vulnerable. To make a connection, a law firm needs to be very careful about the language it uses – emotional triggers and language which makes a prospect feel as though they are being addressed directly. This can make clients feel secure in coming to your company with their problems. A call to action can work in a similar way, by calling upon the prospect to make a decision to let you help them. A call to action is also something which can benefit from reiterations – successful campaigns quite often repeat the call to action from an advert on the landing page itself. The adverts are not the only part of an AdWords for a law firm which needs to be done to perfection – everything needs to be checked and re-checked to make sure that your company presents the best version of itself to prospects. Before the campaign goes live, we always make sure to test at least 5 different versions of the text which will be used. This is to ensure that every advert looks its best, and has the highest potential for converting prospects to clients. We also use different match types with each advert to see which ones perform better. During the campaign itself, when marketing personal injury practice, we conduct continual investigations into which adverts are making conversions, and why. Keeping track of conversions allows us to see which adverts are profitable and which are not, so we can shift the money which is placed on each advert around. Remarketing is a way of following up on prospects who almost became clients, but whom, for some reason, never completely followed through. A remarketing campaign follows the potential client around, attempting to persuade them to come back, and finish what they started. It is a must while running an AdWords as a part of personal injury attorney marketing. The law firm devised a remarketing campaign with two goals in mind: to boost the return on investment they had put into the campaign and to increase conversions from visitors and past clients. Their approach was to use a remarketing campaign which used specific lists which targeted people based on their differing ages, genders, and specific injuries. The results of the law firm using a proper remarketing campaign were a thirty to forty percent growth in revenue. Be Convenient – make sure that your site is easy to navigate as that will help clients when they are looking through it. Make sure there is a separate page with all needed contact details as your email, phone number, and address. Also, this page should be readily available from all points of the site. Be Optimized – make sure your site is optimized as this will make it easier for potential clients to find you. When it comes to how to generate personal injury leads, being visible in searches (while SEO is a long term strategy) can be very useful for overall visibility. If you are not sure how to do it correctly, you can ask law firm SEO experts (as we are) for help. Be Local – make sure that your firm is listed in local directories and review platforms such as Avvo and Yelp to be right there where your clients live. Be Social – social media platforms are very useful in increasing visibility when it comes to your firm, as it is a medium which many people use on a regular basis. How do personal injury lawyers get clients? By being visible. Advertising a personal injury law firm is not something which is altogether easy, since the same tools which your firm will most likely use for the purpose are already being used by everybody else, including your direct competitors. This is not to say that they are useless; simply that care will need to be taken to attract new clients to a law firm. The issue of how to get personal injury clients is complicated and thus it needs a complex and professional solution. + 50% in sales within 1 month! If you need qualified assistance with advertising your law firm, WillbeCoded.ca can help you to both increase your online presence and gain new clients.